Your Move are pleased to offer for sale this semi-detached four bedroom property to which an early internal viewing is strongly recommended to appreciate the size and composition of the accommodation which briefly comprises to the ground floor entrance porch, reception hall, sitting room, dining room, breakfast kitchen, rear hall and cloakroom/w.c. Whilst to the first floor the landing gives access to four bedrooms and family bathroom/w.c. Externally there are gardens to the front and side along with a garage and outbuildings. In addition the property further benefits from double glazing as stated and gas central heating system. 16' 3" x 8' 11" (4.95m x 2.72m) Front entrance door leading into the entrance hall having picture rail, dado rail, part panelling to the walls, feature flooring, stairs to the first floor, radiator. 16' 7" (incls. Bay window) x 13' 0" (5.06m (incls. Bay window) x 3.97m) Single glazed window having views, decorative feature fireplace and hearth, decorative mouldings to the walls, picture rail, double radiator, panelling to the ceiling, feature flooring. 16' 3" (reducing to 3.95m (13'0) x 13' 11" (4.96m (reducing to 3.95m (13'0) x 4.25m) Having arched recess leading to single glazed french doors leading to the side garden, delph rack, feature fireplace, timber effect framing to the walls, radiator, feature flooring. 22' 8" x 8' 11" (6.92m x 2.71m) Inc Units: Range of wall and base units with complementary work surfaces over, Belfast style sink, built-in oven and hob, space for appliance, radiator, tiled flooring, double glazed window. Two single glazed skylight windows, dado rail, feature archway recess with lighting, airing cupboard housing hot water cylinder, doors to all first floor accommodation. 13' 2" (incls. Bay window) x 13' 0" (4.01m (incls. 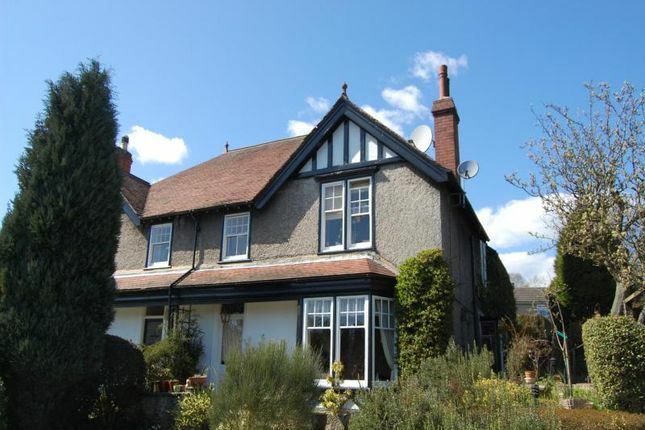 Bay window) x 3.97m) Single glazed bay window to front aspect having views, radiator. 14' 0" (incs. Wardrobe) x 13' 1" (4.28m (incs. Wardrobe) x 3.98m) Single glazed window, dado rail, radiator, feature fireplace. 13' 11" (incs. Wardrobes) x 10' 4" (4.23m (incs. Wardrobes) x 3.15m) Single glazed window, radiator. 9' 9" x 8' 11" (2.97m x 2.73m) Single glazed window, feature flooring, radiator. Four piece white suite comprises panelled bath, shower cubicle, low level w.c, pedestal wash hand basin, tiling to the walls, radiator, double glazed frosted window. The front garden is laid to lawn having a variety of mature plants, shrubs and trees, steps leading up to the front entrance door, views to the front of the property. There is a seating terrace area, variety of shrubs and bushes. There is a side private road that leads round to the rear of the property where there is a parking area. There is an outbuilding to the rear of the property. Not Measured: We recommended that you check to ensure that the space is suitable for requirements. Directions :-Leaving Rutland square along Monyash Road continue up the hill and by the railings take a sharp right hand turn where Parsonage Croft is the turning immediately to the left at the top of the hill on the right hand side.